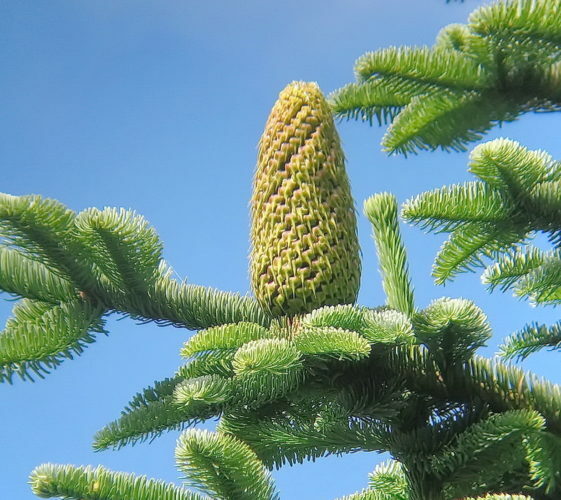 Abies procera, as described in 1940 by Alfred Rehder (1863–1949), in Rhodora no.42, is commonly known as Noble fir. 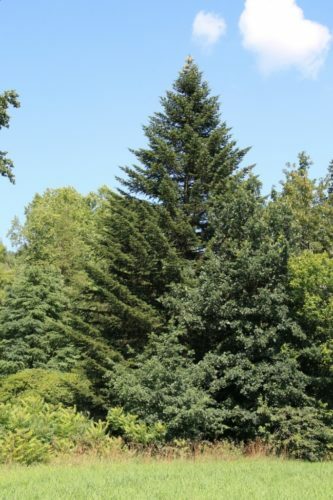 It is American's largest fir, which explains its species name which is Latin for "tall." 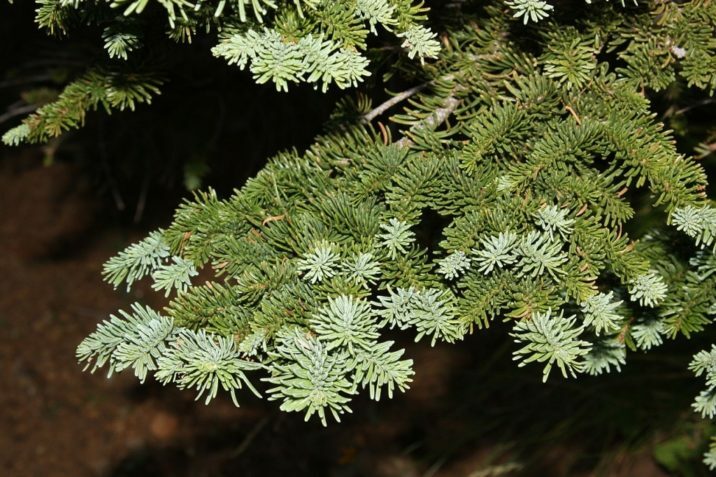 According to William Critchfield (1988), it is notable that A. procera hybridizes extensively with A. magnifica in northern California and southern Oregon; see discussion under Abies magnifica. 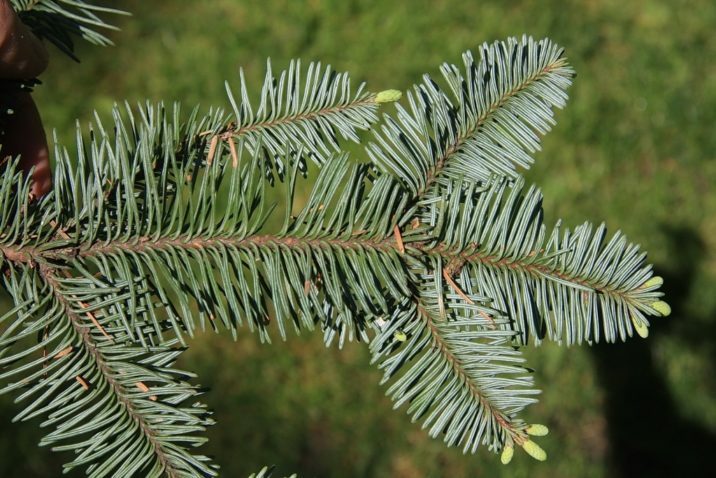 Given that Abies grandis also hybridizes with A. concolor var. lowiana in the same area, field identification of firs in that part of the world is quite the problematic task. Ethnobotany. The wood was formerly used for airplanes and ladders, in both cases because it is light, strong and can be bent far before breaking. It is still regarded as one of the best true firs for lumber due to the strength of the clear, lightly grained wood. Description. 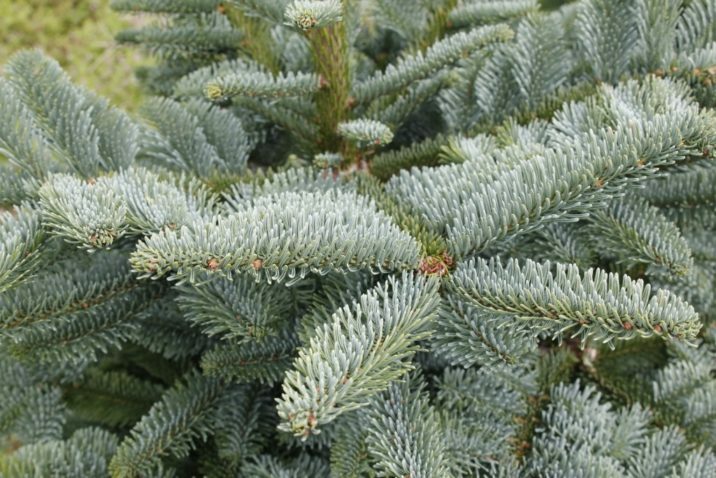 Noble fir is an evergreen coniferous species of tree which grows to mature heights of 130 to 230 feet (40 – 70 m), with a 6.5 foot (2 m) diameter trunk, measured at breast height; exceptionally growing to 295 feet (90 m) tall and 8.9 feet (2.7 m) in diameter, with a narrow conic crown. Bark on young trees is smooth and gray with resin blisters, becoming red-brown, rough and fissured on old trees. Branches diverge from the trunk at right angles, and are stiff. Twigs are colored reddish brown, and finely pubescent for several years. Foliar buds are hidden by leaves. They are small, tan colored, ovoid shaped, not resinous, with a rounded apex. Basal scales are short, broad, with an equilaterally triangular shape, pubescent centrally, not resinous; with entire to crenate margins, and sharp-pointed apices. 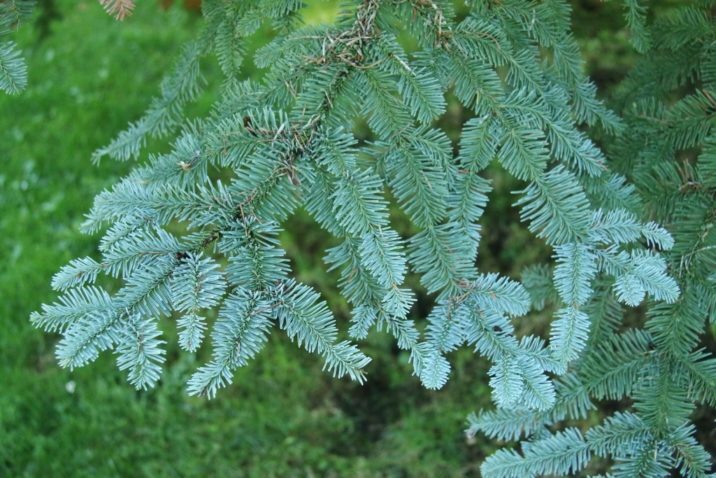 Leaves are needle-like, measuring 0.5 to 1.5 inches (1 – 3.5 cm) long, colored glaucous Blue-green above and below with strong stomatal bands, and a blunt to notched tip. They are arranged spirally on the shoot, but twisted slightly s-shaped to be up curved above the shoot. 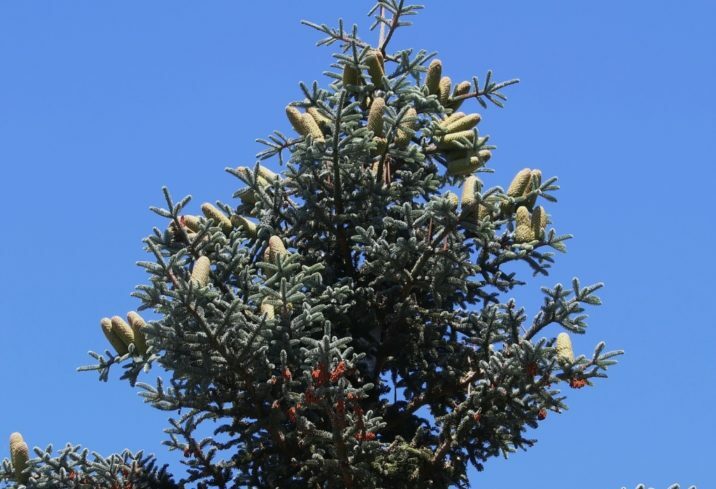 Seed cones are erect, measuring 4.3 to 8.7 inches (11 – 22 cm) long, with the purple scales almost completely hidden by the long yellow-green bract scales; ripening brown and disintegrating to release the winged seeds in fall. 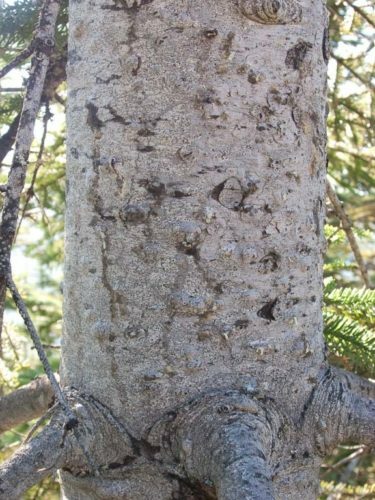 Abies procera is very closely related to Red fir (Abies magnifica), which replaces it farther southeast in southernmost Oregon and California, being best distinguished by the leaves having a groove along the midrib on the upper side; Red fir does not show this. 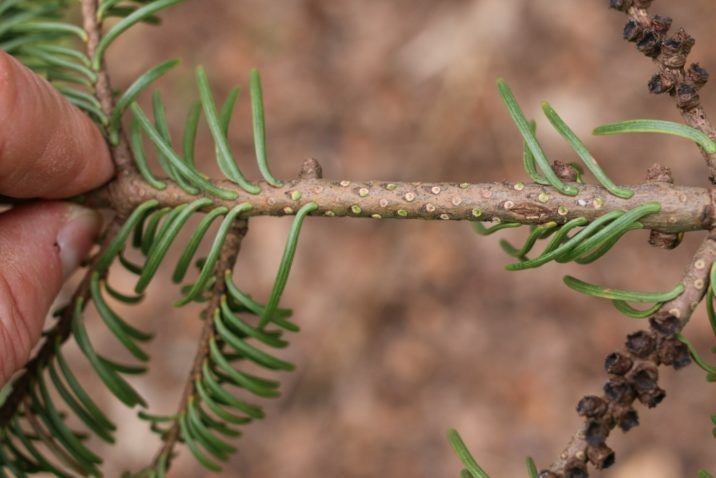 Red fir also tends to have leaves that less closely packed, with the shoot bark visible between the leaves, whereas the shoot is largely hidden in Noble fir. 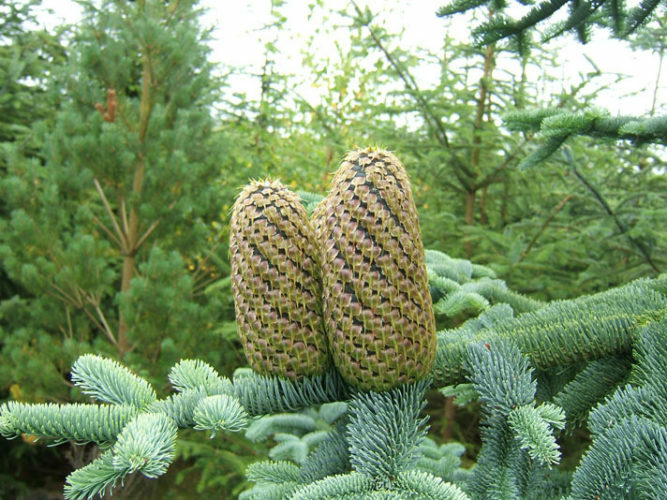 Red fir seed cones also mostly have shorter bracts, except in Abies × shastensis; a hybrid of Noble fir and Red fir. Distribution. This species is native to the Cascade Range and Coast Range mountains of extreme northwest California and western Oregon and Washington. 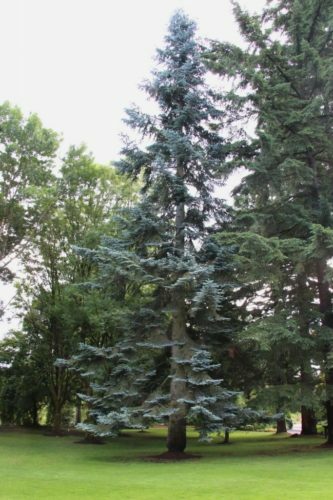 It is a high altitude tree, typically occurring at elevations of 980 to 4,920 feet (300 – 1,500 m) above sea level, only rarely reaching tree line. 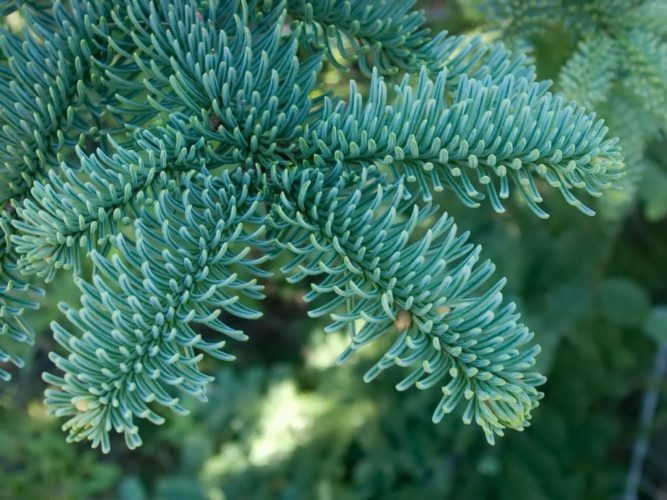 Attribution from: Richard S. Hunt, Abies-Flora of North America Editorial Committee (editors); Flora of North America North of Mexico, Vol. 2; ©1993, Oxford University Press. Abies procera on the Saddle Mountain Trail, Saddle Mountain State Natural Area in Oregon. Foliage detail. 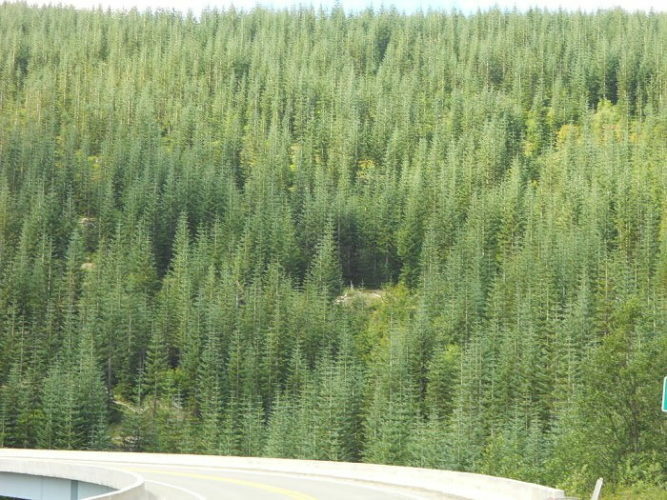 Abies procera — along the drive into Mt St Helens National Volcanic Monument, Washington, one can see this young grove of noble fir that was planted shortly after the blast. In the right light, the branch structure has a hypnotic effect. 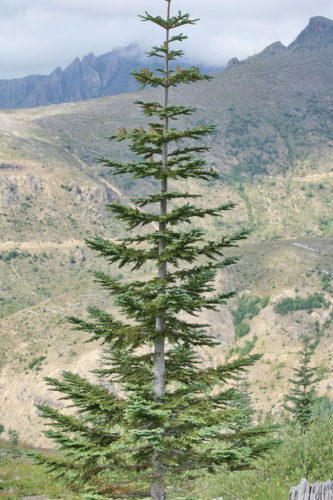 Abies procera growing on volcanic devastated area, Mount St Helens, Washington. Abies procera — bark detail.